I am an idiot. For those that know me, it may come as a surprise. Generally, I hide it pretty well. It doesn’t apply to everything, but when it comes to some basics, I can be pretty dumb. For common sense items, a challenge for me is to communicate those elements. In my marketing role, I can’t always explain why a certain action should be taken, but I know the results. I think with the user in mind. That radar is on wherever I go. but to my point … I arrived early to the starting line for packet pickup and meandered over to the table. Went through the routine of giving my name and waiting for them to find it on the list. They didn’t find it so went over to another list, asked me when I registered to which I replied 5-6 weeks ago, and grabbed another person for help. I was sent over to the registration table where the lady recognized me from the Colfax Ambassador team. She said fill out a form and handed me a bib. Sweet! Come to find out later that day after going through my email, I had purchased the registration through a deal site, but there was another step to actually complete the registration. Idiot. Onto the recap .. which just may reaffirm my idiotness (new word, deal with it). 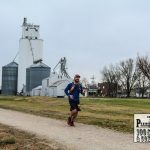 In my continuing quest to prove I am right, I followed my what not to do before a marathon. As in, I made all of those choices again. And then some. Night before my wife and I went out to see a show in the theatre district. We have season tickets and the show just happened to be the night before a race. For dinner we tried out a new place (rule breaking) and chose to eat fried chicken swimming in a plate of mashed potatoes with bourbon sauce. Nope, you won’t find that suggested in any running book. Off to the show where we had red wine (there has to be something good in there!). Show got out earlier than expected so we didn’t want to deprive babysitter of money (self justification) which led us to a bar. Beer and ice cream later (just gets better right? ), head home to fall asleep around 11:30p. What not to do night before a race. You’re welcome. This is a fun race and decided to come back for a 2nd year in a row. Mostly because last year I did sucky horrible, but also because the course has a hill at mile 7. 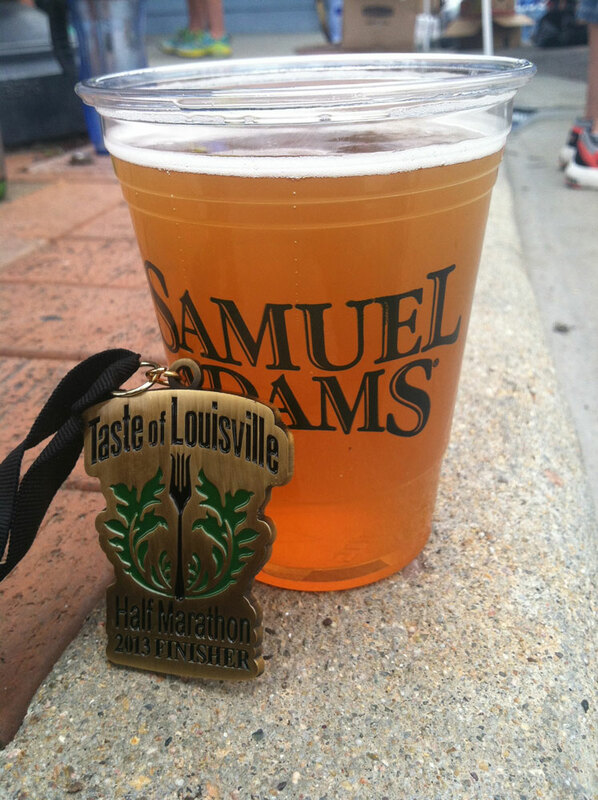 You know, that spot in a half marathon where your body wants to take a break. Then after a few miles, you turn around and go back over that same hill. Good times. 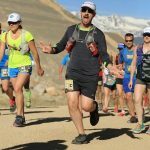 I chatted with a few people that said they read this blog and others that asked about companies sponsoring me. Then I made my way to the starting line with about 5 minutes to go. My guess is a gym or personal trainer is a sponsor of the race because the next thing I knew, a lady over the loudspeaker was leading the crowd in pre-race stretching and warm-ups. At times it was like being in the middle of a Zumba dance. For me, the first couple of miles is my stretching and I am really not into group synchronized exercise. Everyone has their own pre-race prep. This was not one of mine. If anything, it provided some good chuckles to lighten the start to 13.1 miles. 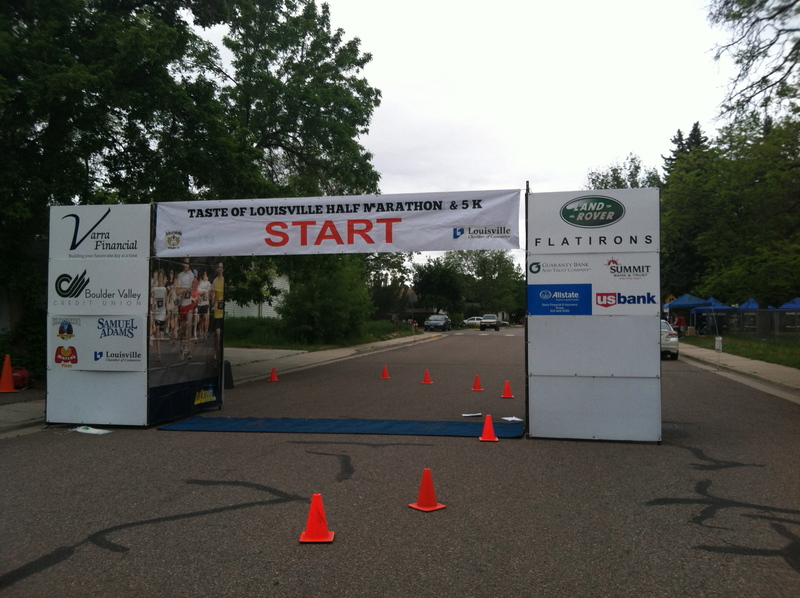 The first mile of the race takes you through downtown Louisville. Vendors were setting up their areas for the post-race activities, spectators sipping their coffee, and a few hundred runners charging down the street. After that, we circle a park and head onto dirt trails. To the guy pushing a double stroller with two kids inside and a dog leashed to it: much respect. He finished ahead of me. Rounding the corner at mile 6 the hill came into view. My only goal in this race was to run up that hill. And I did. It felt great to coast up that hill. In fact, it didn’t seem like much of a hill from memory of last year. 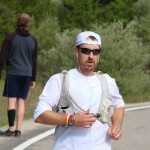 Then again, I had run 3 races in Leadville over the past year. That place has hills. Probably the biggest difference from last year was the temperature. In that it was about 20 degrees cooler this year. That makes for a different nutrition strategy. Oh yeah, I didn’t bother to pay attention to nutrition. New rule to break! Over the hill and rounding into the woods on the path, I recognized some spectators. Friends of mine that live on the course were out cheering on runners! 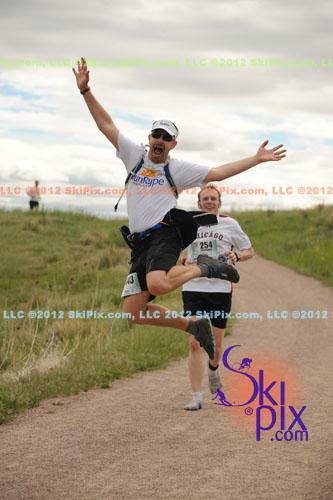 Probably the best surprise in any race is when I see happy faces I wasn’t expecting. Provides a charge of energy that can carry me through several miles. Spectators at any race have no idea how much they mean to runners. Back over the hill a second time. I did walk for 3 minutes on the way up, then said, as I say non-logical things when I run: this hill is an opportunity for training. Where do I come up with these things? Up ahead on the way down was course photographer. I yelled ahead that I was going airborne. And she got a great shot. I noticed 3 others behind me recreated my shot. Just passing along the goodness wherever I can. Made the last 3 miles fly by. About half a mile before the finish line, I noticed a lady limping a bit. I asked if she was alright and she said knee hurt. I told her to run 50 steps with me and we can count them outloud. After about 20 steps, she went into a sprint for the finish line. Such a great motivational running technique. I crossed the finish line and did my best model pose while the volunteers cut off my timing chip. After that, went and collected my slice of pizza along with a Sam Adam’s beer. They get me. Another great half marathon in the books and towards the bigger race set for August. That night before would have made it difficult to get up in the morning. ha.